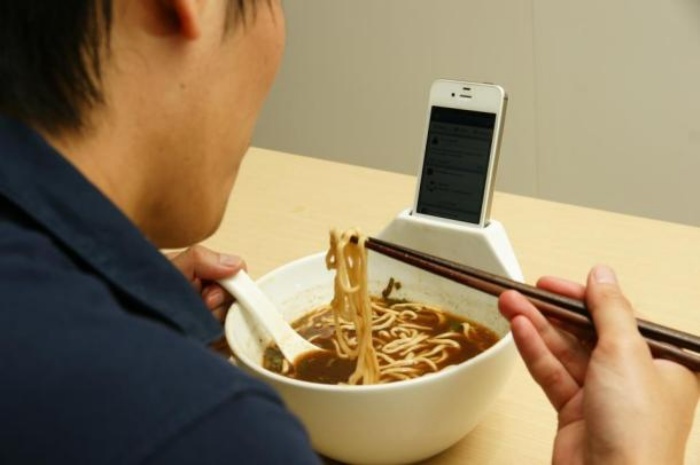 Anti-Loneliness Ramen Bowl: You'll Never Have to Eat Noodles Alone Ever Again | OhGizmo! By Hazel Chua on 01/21/13 • Leave a comment! Noodles are my comfort food. I know they’re not the healthiest of foods to eat, but there’s just something about it that reminds me of warm nights and better days to come. For those unavoidable times where you have to eat alone and you happen to be having some instant ramen (or some other food you’re eating in a bowl), then you won’t have to be too alone anymore with this ‘anti-loneliness’ ramen bowl by MisoSoupDesign. It’s basically a bowl with a smartphone holder. From the looks of it, they’ve only made the holder in one size, and while I’m sure that it can accommodate a variety of different-sized smartphones, larger-sized devices (like the Galaxy Note, for instance) probably won’t fit. No pricing information has been released yet, although MisoSoupDesign has already released images of samples of the bowl that they’ve already made. Hot noodles, a friend on the other end of the line, and reruns of your favorite show? A night home alone doesn’t sound that bad now, huh?